The Internet is a wonderful invention with its vast treasure chest of text, image and video. You can spend a lifetime and still skim but a tiny surface of the vast Internet. But as with all things touched by humans, the Internet is also a dangerous zone where all kinds of shady creatures lurk. These shady elements install viruses and other malware on your PC, steal login information to your bank, Facebook and e-mail accounts, wipe out the contents of your hard drive, spy on you by turning on your PC’s camera and install malicious software that lets the bad guys use your computer as a bot to send out spam or attack other computers. While it’s impossible to be completely safe from the predators, you can minimize the exposure to viruses and malware by using a bunch of free tools. 1. Ghostery – Last year, I lost one of my Windows XP PCs because of a Google Redirect virus. If only I had Ghostery running on that system I wouldn’t have suffered so much tension. Ghostery prevents redirects of web pages and tracking of your browsing habits through web trackers (hidden objects like scripts, pixels and other elements embedded in web pages). A free browser extension, Ghostery is available for Firefox, Internet Explorer, Safari, Opera and Google Chrome browsers. Do not enable GhostRank if you’re worried about the anonymous data Ghostery collects about tracking elements. Where to get Ghostery – Search in the Extensions tab of your browser. 2. Prey – A free tool that helps to recover your stolen Windows or Mac desktop and laptop and mobile devices (iOS and Android). Once you install Prey, it runs silently in the background although you won’t be able to see it. You can use Prey to safeguard your laptop, desktop computer, smartphone and tablet. 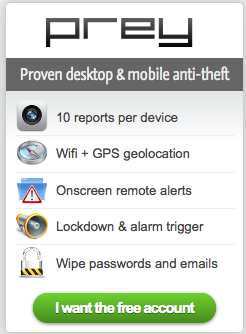 If your device is stolen, Prey will take pictures of the thief (if your laptop has a Webcam), screenshots and geo-location and send them to you via the Prey control panel. You can then use the information and retrieve the stolen device yourself or seek the help of the police. Supports Windows, Mac OS, Linux, Ubuntu, Android and iOS. You can install Prey on up to three devices. The free version gives you 10 reports. 3. AVG AntiVirus FREE 2014 – This free software detects, blocks and removes viruses and spyware. If you can’t afford a full fledged anti-virus and firewall application, then you must at least get AVG AntiVirus FREE 2014. Supports Windows XP, Windows Vista, Windows 7 and Windows 8. Czech software firm Avast also offers free antivirus software for Windows and Mac. 5. ZoneAlarm Firewall Free – While an anti-virus application is indispensable, a firewall too is a must. That’s where the ZoneAlarm Free Firewall 2013 comes into the picture. This is a two-way firewall that proactively protects against inbound and outbound attacks. The premium (paid) version adds support. ZoneAlarm Firewall Free works on Windows XP (SP2 and SP3), Windows Vista, (SP1 and SP2), Windows 7 and Windows 8 PCs. 6. Keeper, KeePass, LastPass – Even if you’re Einstein, a password manager is a great help. After all, most of us deal with passwords for e-mail accounts, Facebook, Twitter, online banking, blog etc. Password managers store all your passwords in an encrypted database. You need to remember just one password or a key file (for greater security, you can set it to use both) to unlock the database. Another benefit of password managers is that they can also be used to generate strong passwords. Keeper – If you’re looking for a free password manager for your Mac, iPhone, iPad or iPod touch, then you must take a deko at Keeper. Keeper is available on the Mac or iPhone app store. Premium (paid) version adds features like unlimited cloud storage, syncing across various devices and backup. KeePass is another open source password manager. The free software, which comes with mufti-language support, works on Windows, MacOS, Debian/Ubuntu Linux, OpenSUSE Linux and BSD computers. LastPass offers a free, ad-supported version of its password manager that includes a master password, automatic form filling and one click login. LastPass supports Windows 2000, Windows XP, Windows Vista, Windows 7, Windows 8, MacOS and Linux operating systems, the major browsers (Internet Explorer, Firefox 2+, Google Chrome, Opera 11+, Safari 3+) and the key mobile platforms (iOS, Android, Windows Phone 7.1+, Blackberry OS 4.2.1). 7. Secunia Personal Software Inspector – We all have multiple applications and browsers running on our computers. Keeping them all up to date with the latest security patches is a tiresome chore. That’s where Secunia Personal Software Inspector comes in by automating the process of downloading and installing the latest security patches for your applications. Secunia Personal Software Inspector supports Windows XP (SP3), Windows Vista (SP1 or later), Windows 7 and Windows 8. The software is also available for Android. 8. Belarc Advisor – A free personal PC audit tool that provides a detailed profile of your installed software and hardware, network inventory, missing Microsoft hotfixes, anti-virus status, security benchmarks and displays the results in your browser. Supports Windows 8, Windows 7, Windows Vista, Windows XP, Windows 2000, WindowsNT 4, Windows Me, Windows 98, and Windows 95. Belarc Advisor supports both 32-bit and 64-bit Windows. Works with Internet Explorer, Firefox, Safari, Opera and several other browsers. 9. Qualys BrowserCheck – This free app helps to prevent browser-based security breaches by scanning the browser and the various plugins you may have installed to check if they’re up to date. Available as a plugin and through the browser. Scanning via the BrowserCheck plugin is supposedly more thorough than doing it via the browser. Supports Internet Explorer, Safari, Firefox, Chrome and Opera browsers. 10. Sandboxie – This free download runs your programs in an isolated space that prevents them from making permanent changes to other programs and data in your PC. Cons: After 30 days, the software starts pestering you to upgrade to the paid version but will keep working even if you don’t upgrade. Supports Windows 2000, Windows XP, Windows Vista and Windows Server 2003 operating systems.